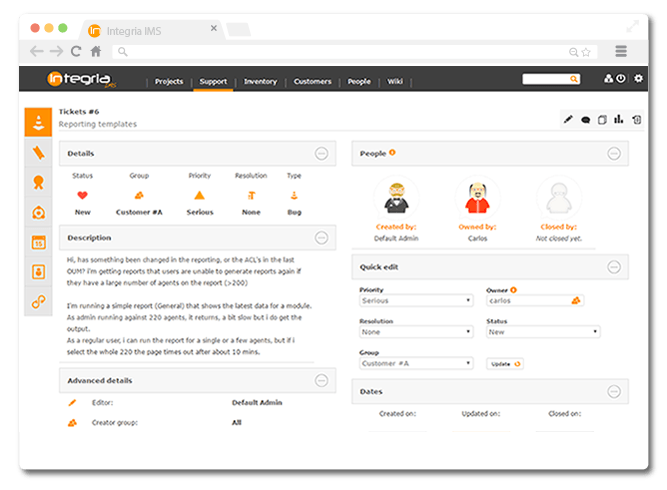 Integria IMS is an on-premise ticketing software aimed at SMEs, which is able to integrate in a single tool all tasks related to customer management, project management and the development of services. In addition to this, it includes a large number of useful features designed for different types of companies. Why do I need Integria IMS? Integria IMS is a simple, powerful and easy-to-use help desk software. It allows you to customize the fields of the support tickets, define customized workflows, make reports and establish different service level agreements (SLA). Plus, you will be able to know if your customers are satisfied with the customer service thanks to its integrated quality assessment system. It has an automated inventory and is controlled from a single interface. 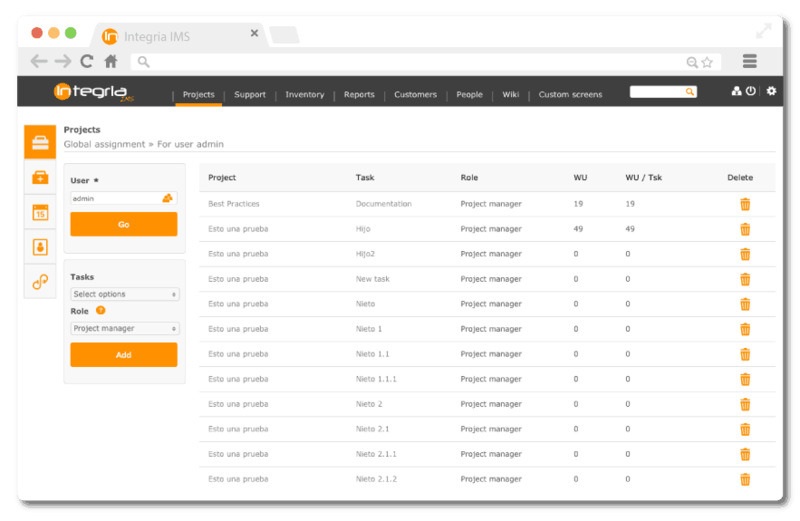 It streamlines processes by reducing the time and costs spent in the management of your projects. Thanks to its personalized reports, you will be informed and you will be able to see the management and quality of the service provided in real time. It will increase the level of satisfaction of your customers and employees, which will allow them to work as productively and efficiently as possible. And there is no limit to the number of simultaneous users. Unlike other SaaS tools, by creating customized tickets, you will be able to adapt the process to your needs. Integria IMS is a powerful help desk tool. Your customers will be able to open queries via email, mobile App or even through integrations with third parties via API (your own corporate website or an extranet). Thanks to the workflows, you will be able to create notifications, escalations and actions which will suit the needs of your company. It also has extra features for support such as the knowledge base, downloads for the final customer and the CRM module. Enable your customers to open queries via email, mobile or third-party integrations via API. Plan, allocate and control centrally and in real time how each project develops. Control inventory by customizing fields and asset relationships. Do you want more information about Integria IMS?